A lovely interactive bedtime book with twinkly foil stars, touchable fluffy sheep and a turning wheel. Count these sheep before each sleep. Turn the wheel to make five snow-white sheep leap across the starry night sky. Stroke their soft, flocked wool; see the silver foiled stars twinkle; and turn the pages to explore lots of magical night-time scenes. 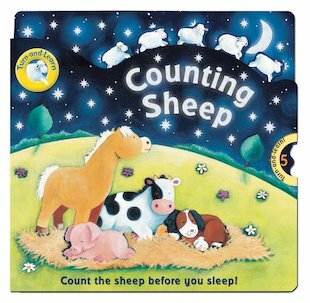 There’s also a gorgeous bedtime story to read, full of sleepy farmyard animals. Can you count all the sheep before you fall asleep? A truly enchanting way to get your head nodding.